A team of employees from the Center for Advanced Transportation Technology Laboratory (CATT Lab) has once again participated in the Global Game Jam. The team consisted of Michael Couture, Jenny Lees, Todd Lees, Walter Lucman, Andrew Lund B.S. ’07, and Michael VanDaniker M.S. ’09, B.S. ’06. The theme of this year's Game Jam was Ouroboros, the snake that eats its own tail. It symbolizes life, death, and rebirth. This is the third year CATT Lab employees have participated. About the game: The object of the game is to cover as much ground as possible as you run away from a swarm of bees. If you fall from the platforms you will enter a death realm. To escape, you must make your way to the Ouroboros medallion on the far side of the room. Once you escape, you continue running from the bees (hence life, death, and rebirth). The game ends when you've spent a cumulative 60 seconds in the death realm. To play, you simply use the left and right arrow keys to move, and the up key to jump. Everything you see and hear in the game was put together in-house during the 36 hour period the team was allotted to complete the game. 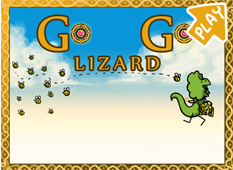 To play the game visit: Go Lizard Go!